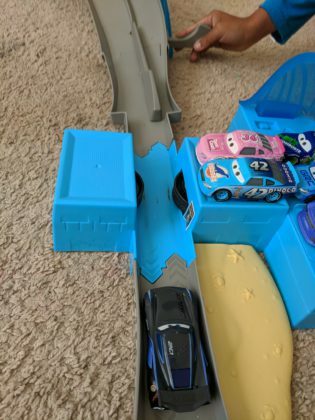 Toy cars are wildly popular around this house. 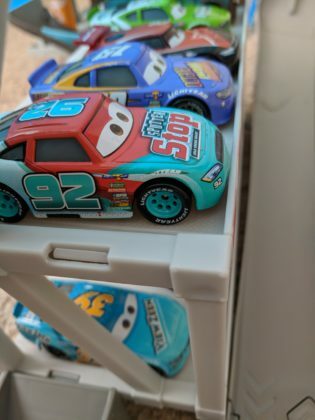 My little dude collects NASCAR diecast with over 200 now and in recent years has begun amassing a collection of Disney Cars vehicles as well (benefits of being the lone grandchild, nephew, etc.). 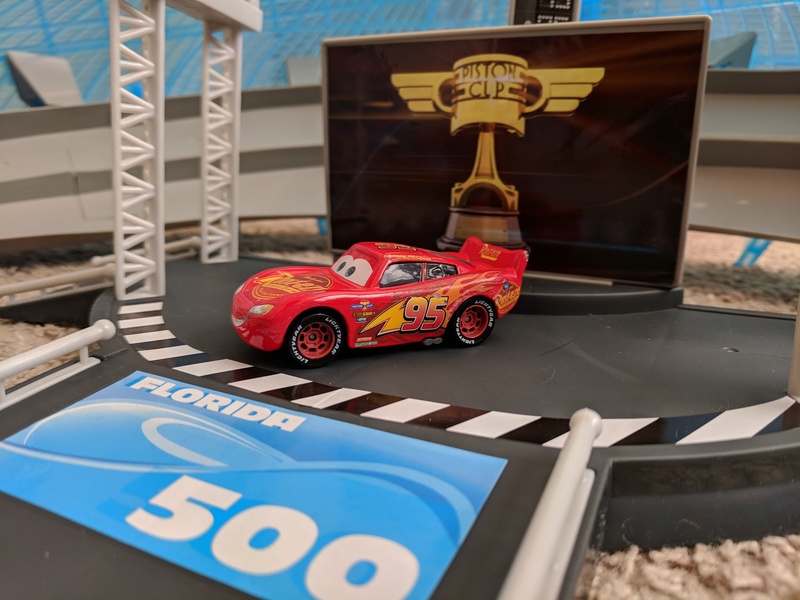 Months ago, at the D23 Expo, he fell in love with Mattel’s Ultimate Florida Speedway as we wandered the showroom floor. It was only a display model but it caught his eye and I found myself peeling him away from away it numerous times throughout the event. 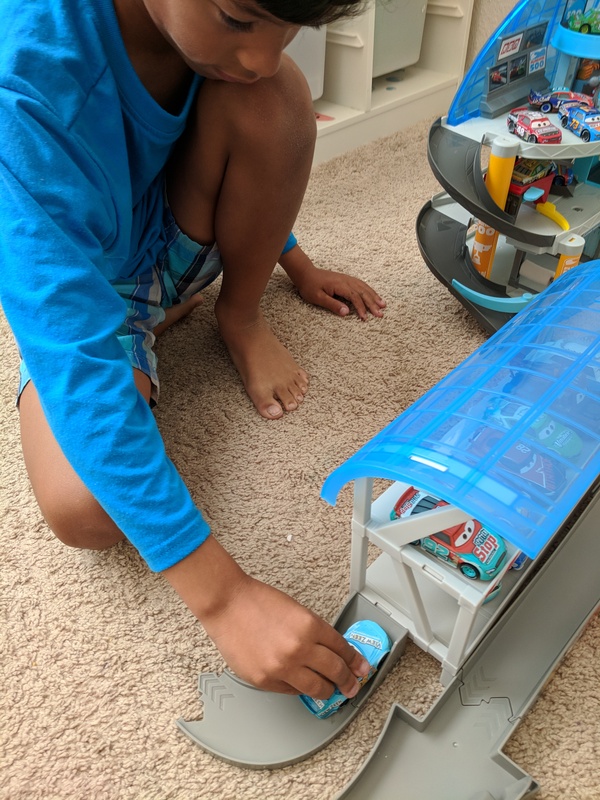 So we were very excited when we were invited to review the playset for our readers as it hits toy shelves. 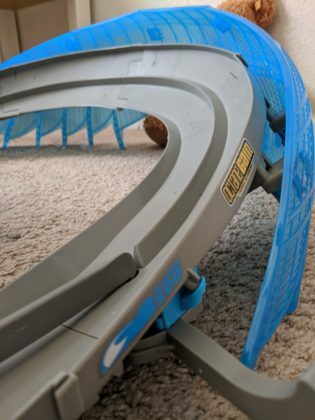 Billed as the “Biggest Cars Track Set Ever Made!,” it measures over 5 ft long and about 32” inches across. The speedway comes with a single car 1:55 scale Lightning McQueen. The track playset captures the beauty of the movie’s Florida speedway well; an oval track with high banked curves and translucent blue accents. 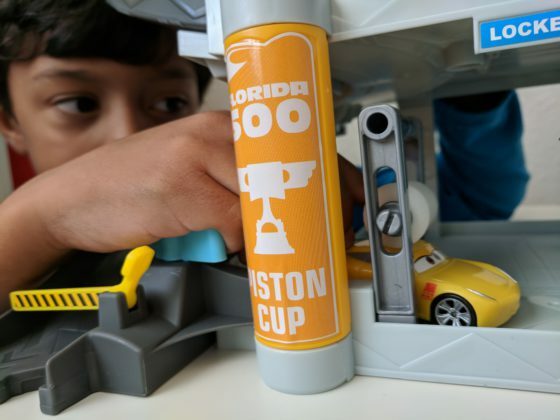 It comes with a grandstand set piece that can hold 12 spectator cars and a central Winner’s Circle setup with a Piston Cup backdrop. 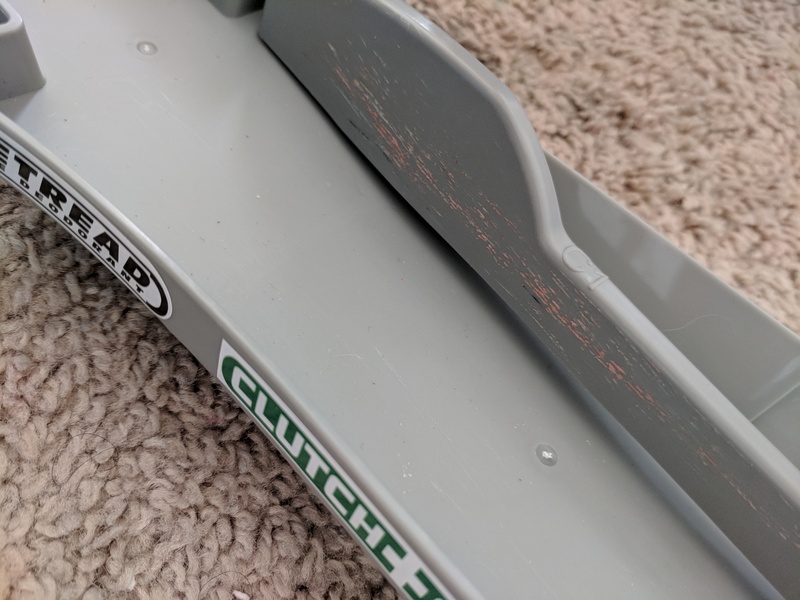 It took us about 40 minutes to apply the decals and assemble the track. A Phillips screwdriver is needed for the battery pack but no other tools are required. 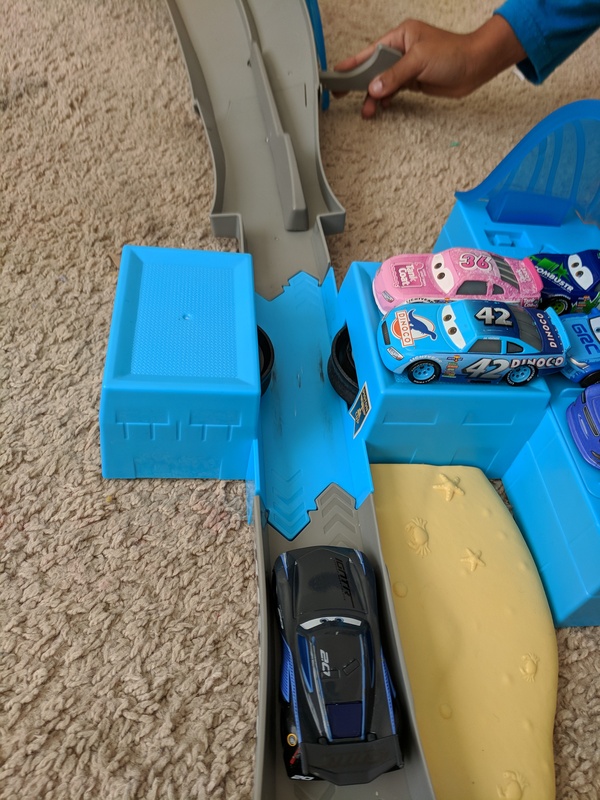 Cars are propelled around the track via a motorized booster/launcher that is powered by four D batteries while line changer arms allow for side by side racing using inside to outside lanes. 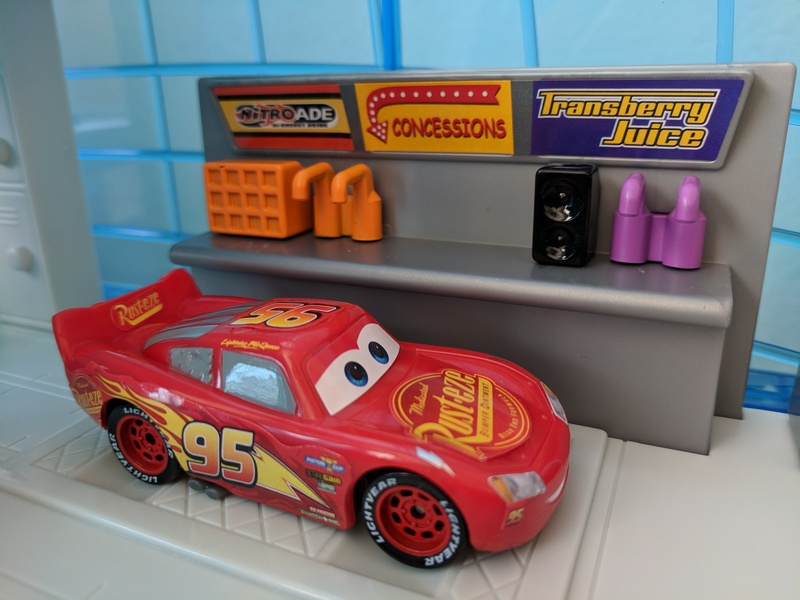 We had success racing the included Lightning McQueen car as well as previously purchased Cars brand vehicles such as the Radiator Springs Racers from Disney Parks but not Luigi Rollickin’ Roadster vehicles. 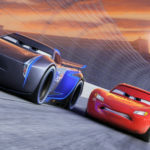 We successfully launched numerous other Cars 3 diecast including Jackson Storm and various Cars 2 diecast such as Tex Dinoco and even Mater. 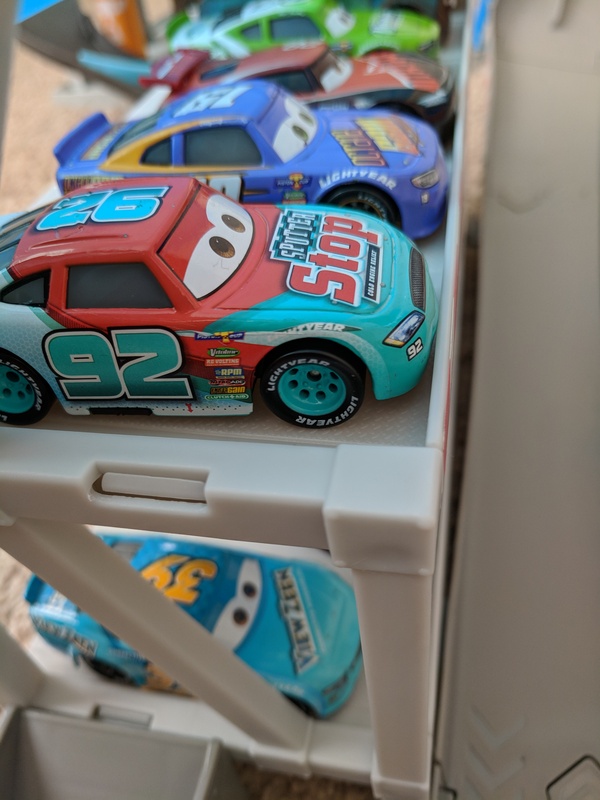 Given the more narrow design we were thrilled to successfully race 1:64 NASCAR diecast as well as various Hot Wheels vehicles. The booster motor is not whisper-quiet, with a noise volume similar to our smaller vacuum and, from time to time, vehicles did flip or lose momentum and fall off the track. 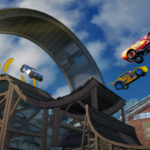 However, we were able to race for several consecutive laps before having troubles and neither of these detracted from our fun. The speedway is one of several playsets from Cars 3 and they are able to connect with each other. We also had the opportunity to play with the Florida Speedway Mega Garage. 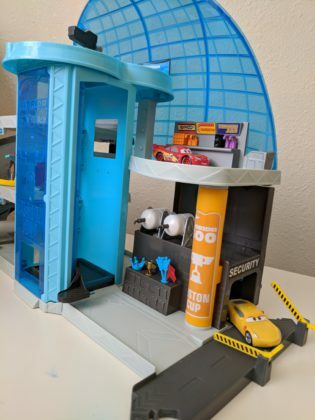 This playset comes with two plastic, not diecast vehicles Cruz Ramirez and Lightning McQueen. They also worked successfully with the speedway. 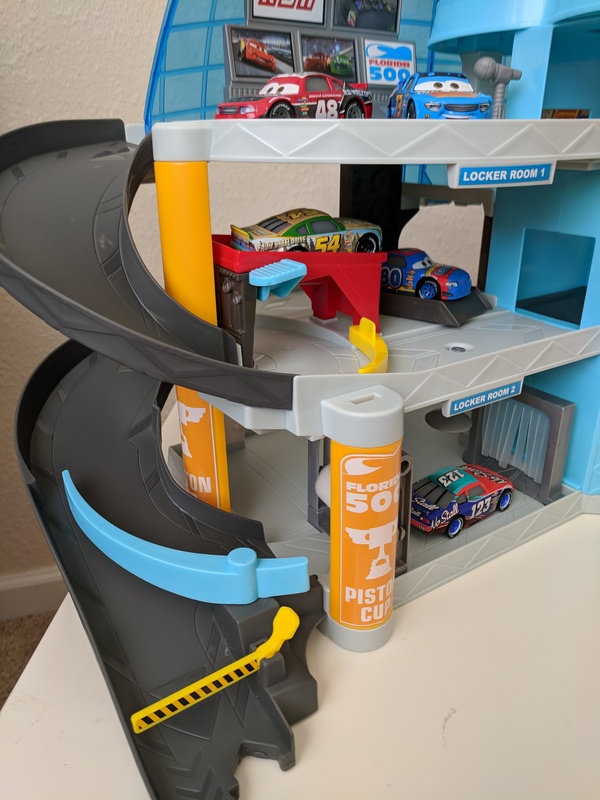 The Mega Garage offers various areas of play over four levels and is human powered, no batteries needed. While I appreciated the funny Cars world references like a concession stand featuring Transberry Juice, the spiral race ramp and elevator he could raise/lower himself were big winners with my little dude and the top floor media zones ignited imaginative play. 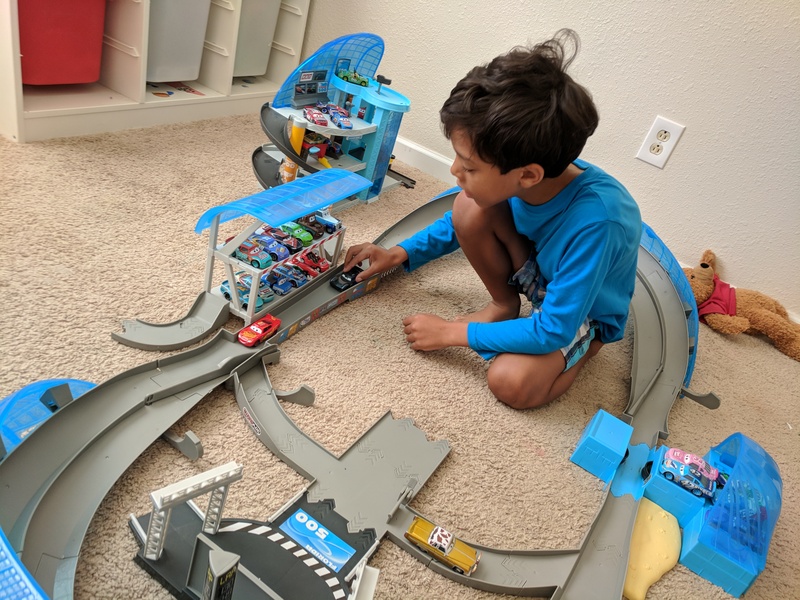 I suspect both playsets will be featured in future stop-motion films — a favorite hobby of my little dude. Mattel provided the toy for the purpose of a review. 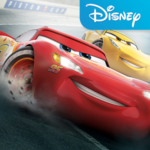 ©Disney/Pixar © 2017 Mattel. All Rights Reserved.